Maintaining a job requires an employee to have an interest in the work that he is doing and to have a deep connection and commitment to the company that he is working in. However, there are moments in one’s life when motivation could not be found which then leads to an employee’s poor performance in his work. If this incident becomes consistent, the employee will become a waste to the company rather than someone who will lift the company higher than their competitors. This is why companies observe disciplinary measures for their employees, and this can be done by sending written reprimands to the poorly performing employee. What Is a Written Reprimand Form? A written reprimand form is a type of HR form which is essentially used by the human resource personnel of the company to inform an employee about his need to meet the company’s standards, either in meeting the productivity needs or in his behavior which should be in line with the ethics of the company. This means that a written reprimand form acts similarly to a notice form to be sent by the company to their employees. However, compared to a basic notice form, this document is for helping the employee learn about what he must fulfill in order to retain his employment status. Why Is a Written Reprimand Form Important? A written reprimand form is important due to the significance of its role in being the bridge that connects and helps the company and the employee communicate to each other’s needs, wants, and expectations. 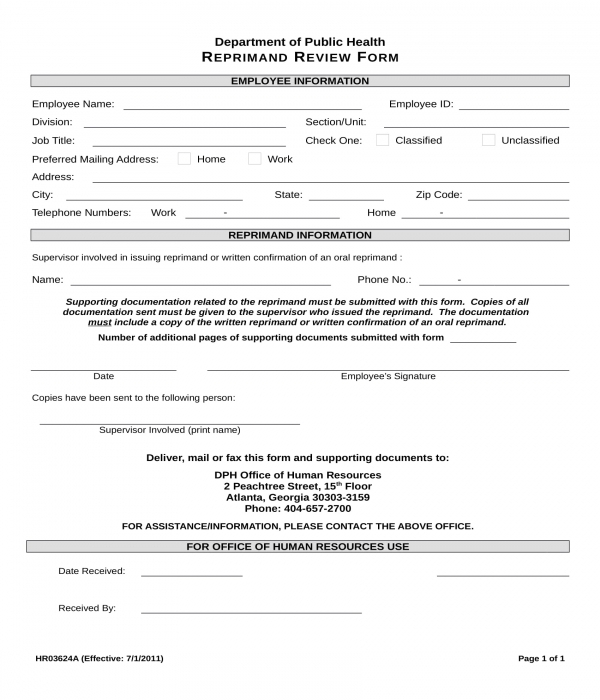 The form must be prepared at all times in the company to make sure that whenever there is an employee who needs to undergo a reprimand process, the company, especially the employee’s head officials and managers, can immediately use and send the form to begin correcting the employee’s actions without any further delays. Another reason for using written reprimand forms is to protect the issuer and the employee. With the form, not any one of the party can make false claims about what has been agreed in lieu of the reprimand. Step 1: Design the header. The header is the portion of the form where the organization or the company’s name and logo will be incorporated. This will be placed on the topmost area of the form. The layout or the arrangement of the header depends on the company which is why it is important to obtain the company’s list of preferences and rules on making their documents. Nonetheless, most companies either place their logos at the center or at the left corner of the header section. If the logo is at the center, then the name of the company should be placed below the logo, while the name must be placed in the same line of the logo but at the center, if the logo is on either corner of the header. In addition, the address and contact information of the company can also be included in the form as well as their electronic mailing address and company website. Step 2: Indicate the title of the form. The title must be stated below the header. Emphasizing the title is important which means that it should either be in bold, underlined, or italicized to gain enough emphasis that will highlight the title from the rest of the content of the form. Step 3: Make the first set of data fields. This first section which will gather identify to whom the reprimand is to be sent should have the name of the employee or the recipient, the date of when the reprimand will be given, and the name of the person issuing the reprimand. In addition, the data fields should not have any content rather an underline or a placeholder for the information of the recipient to be disclosed by the sender or the issuer of the form. Step 4: State a notice for the employee. The notice statement should define the reason why the written reprimand form is being used by the company. For instance, a statement regarding the purpose of the form as a written warning to the employee and an indication that the employee must take heed on the write-ups of the company’s authorized personnel. Moreover, the grounds and the penalties that the employee will be facing or dealing with if he ever fails to comply with the suggestions and requirements in the reprimand should also be included in the notice statement of the form. Step 5: Allocate an area for the incident details. 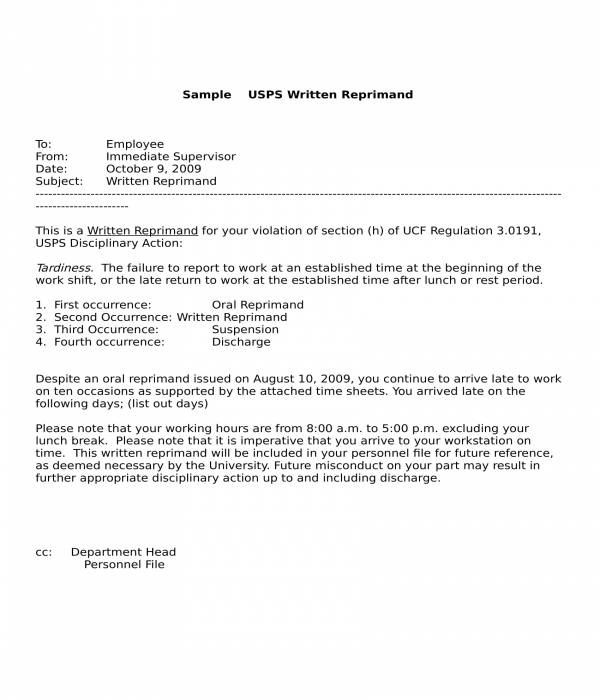 In order to properly explain to the employee how the company arrived at a decision to send him the written reprimand, there must be an area allotted for the details of the employee’s actions which violated the company’s rules, regulations, and have failed to meet the company’s requirements. Below the area for the explanation should be a portion for disclosing the date or dates of when the incidents happened and were observed by the company through their reports and records. If applicable, the location of the incident can also be stated in the form. Step 6: Add lines for the corrective action required to be met by the employee. This portion of the form should be large enough for the explanations and step-by-step process that the employee must take. In addition to this, a checkbox can be placed as well which is for indicating that there are further details on the attached corrective action plan form if ever there is a need for another sheet of document or paper for placing an explanation about the plans and requirements of the company for their employee. Step 7: Incorporate an acknowledgment statement. The purpose of an acknowledgment statement in a written reprimand form is to document the attestation of the employee that he was able to receive the reprimand and that he agrees to commit in performing the stated required corrective actions. Aside from the attestations and the commitment of the employee, the acknowledgment can also be for documenting that the employee understands his rights in filing an appeal to the company management through an employee grievance procedure defined in the employee manual or handbook. Also, the employee must be informed that he can submit comments and suggestions, as well as meet with his supervisor to discuss the actions to be taken if he does not agree on the corrective action. Step 8: Allocate signature areas. This is where the employee and his supervisor be able to affix their signatures and the date of when they have received the reprimand and have signed the form. Lastly, the form should be saved without any data in the fields to be filled out by the issuer of the reprimand in order to retain its blank state making it a ready-to-use template of a written reprimand form. What should be done if a reprimand is given orally by the employer of a company? If an oral reprimand is the only reprimand which is given, the employee can ask from the human resource personnel of the company a template of a confirmation form, or he can also make a written confirmation. This is to properly document the conversation and the agreement made between the employee and the person who is mandating the reprimand. On the other hand, a written reprimand form can also be filled out right after the oral instructions and given to formally document the statements and the agreements. What other information can be incorporated into a written reprimand form? 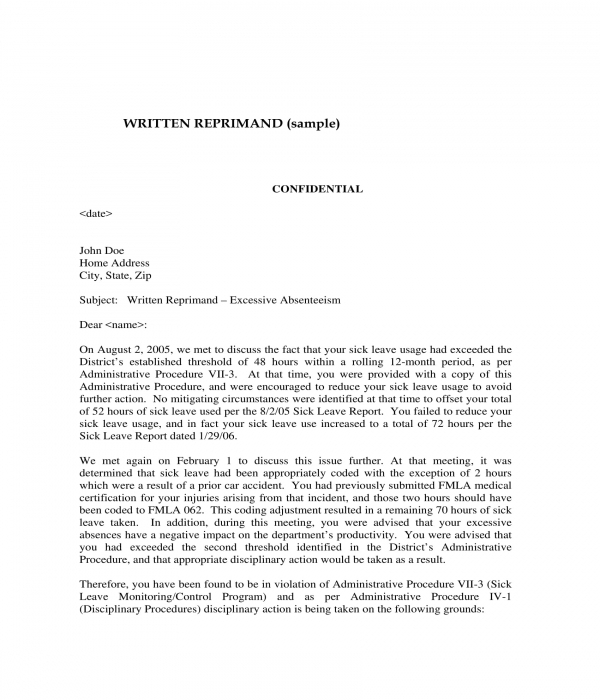 One section to add into a written reprimand form is a portion intended to be filled out by the authorized receiver of the completed reprimand who will be recording the data stated in the form. This section should be able to collect the date of when the reprimand was filed to the authorized personnel for documentation and recording purposes, along with the name of the authorized personnel who received and conducted the recording procedure and his signature to indicate that the form has been validated and recorded in the data system of the company. Another is an area for the list of documents to be filed along with the filled out and signed written reprimand. The list can have checkboxes as well on each item in order to identify which document is not available or not relative to the subject of the reprimand. Moreover, these documents will be the basis and the proof of the issuer of the reprimand for the failures and misconduct of the employee.